Pakistani Girl From Swat Malala Yousafzai who was shot in the head last year by the Militants will go through another surgery for protecting her brain. Doctors of Queen Elizabeth Hospital London has said that the purpose of the surgery is to end a hole in skull of Malala so that her brain can be protected from damage in future. the operation will be done after one week. titanium plate will be inserted in skull to end the hole during surgery. 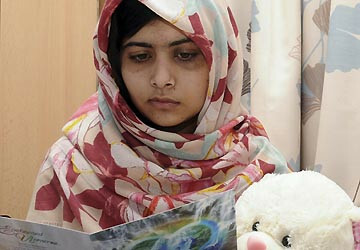 Malala is only able to to hear from her right ear after she was hit by the bullet. For this purpose Doctors are planning to insert a device in her ear so that she could listen from her both ears. Malala Yousafzai was hit by bullet in her head back in October 2012. after this incident she got popularity and sympathy from around the globe.